A lot of the graffiti is really beautiful! Chile has long been the center for radical propaganda painting. As early as 1940 leading Mexican and Chilean artists were painting murals in Chile. 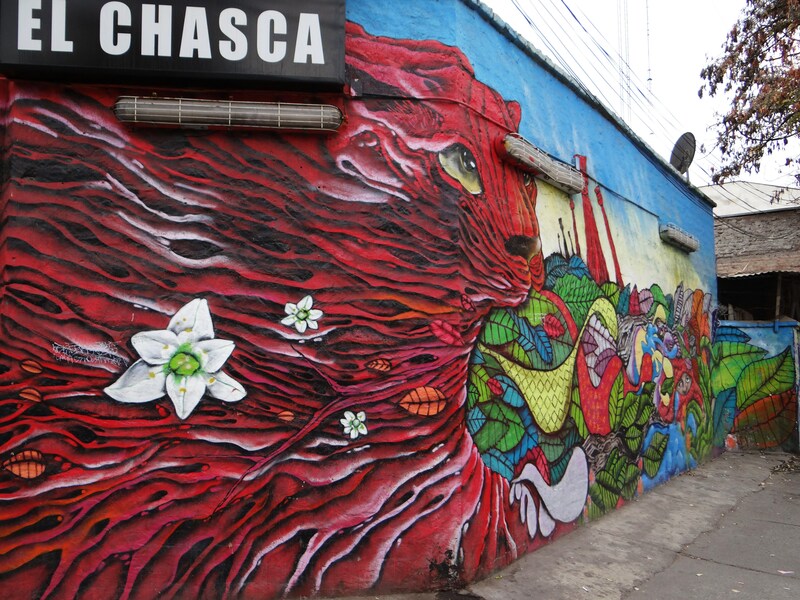 Now, Latin American street art is as innovative as any in the world and Chile plays a really big part in this. I was amazed by the amount and quality of graffiti that covered the walls of Santiago. I spent hours walking through the streets taking photographs of the beautiful “art works” that are on display throughout the city. Chile has embraced an era of new freedoms since the end of Pinochet’s dictatorship in 1990 and made up for some lost time. 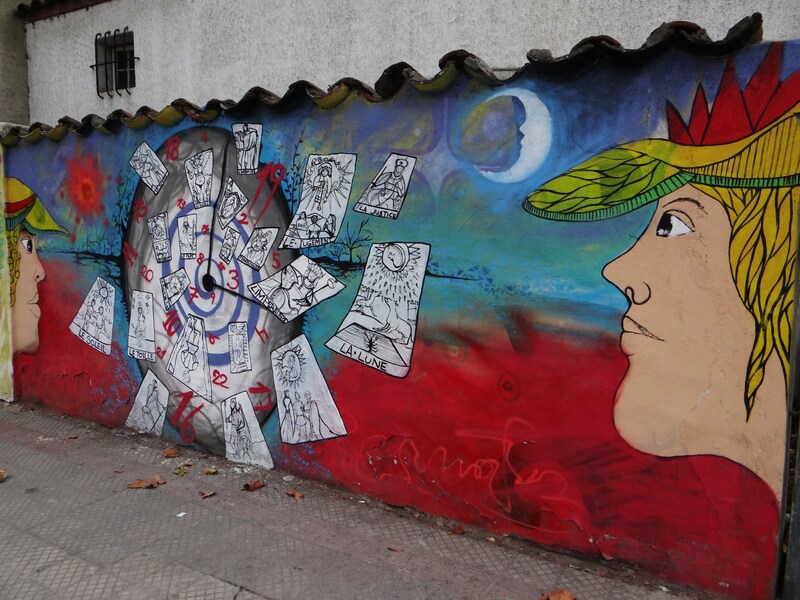 Most of the contemporary artists and graffiteros in Santiago have their roots in Latin American propaganda murals but are looking forward more and more. In 1991 crews of graffiti artists started to work in Santiago and they even formed collectives. I have learned that it is not only Santiago that is covered in graffiti but the while of Chile, from Arica to Punta Arenas. Chile is at the southwest edge of the world, cut off from neighbouring countries by the Andes and this has definitely influences its cultural eccentricity. Today outside mural painting in Chile is encouraged from school age on. 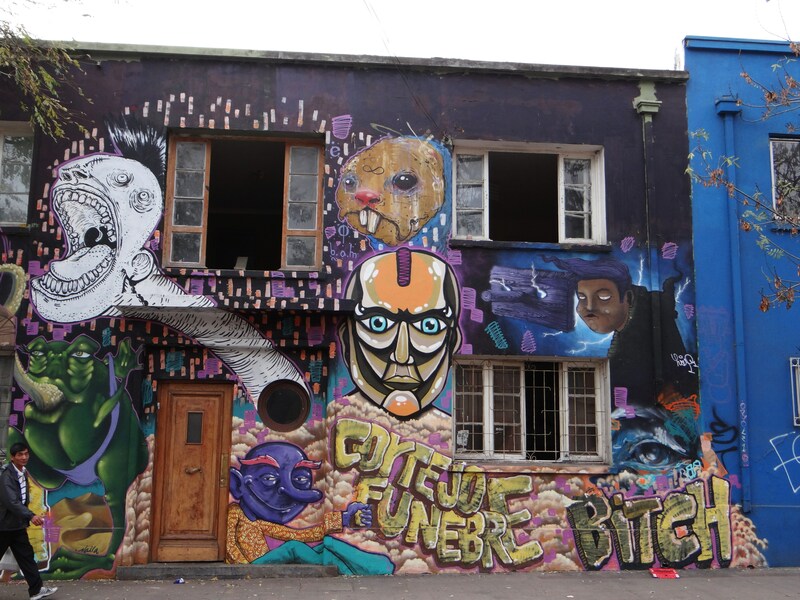 The city’s street artists have painted Santiago into one of the hemisphere’s best concentrations of what has been called the last major pictorial form of the twentieth century. I love that the whole block seems to be covered in street art! I love the brightly painted walls! I will always remember Santiago as the city covered in graffiti, the city that got me interested in street art! Murals even make old tired buildings beautiful! WOW! really, REALLY amazing street art!!! Now I want to visit Santiago! Santiago definitely has some of the most beautiful street art that I have ever seen in any city! I thought my home town of San Francisco has some really awesome street art, but Santiago looks very impressive too! I was raised thinking that Graffiti was all bad, but it has definitely grown on me since I began traveling. I think that there is so much to learn about a place from the pictures that people draw. It isn’t always just scribble. I agree! Graffiti definitely has a very bad name and that is maybe why people now try and differentiate between the scribble that is graffiti and the “art” by calling it street art. I have definitely learned a lot about Santiago through the beautiful murals that cover the buildings here. You REALLY make me want to come to Santiago! Santiago is a beautiful city and if you ever get the chance to travel through Chile you should definitely stop here for a while! 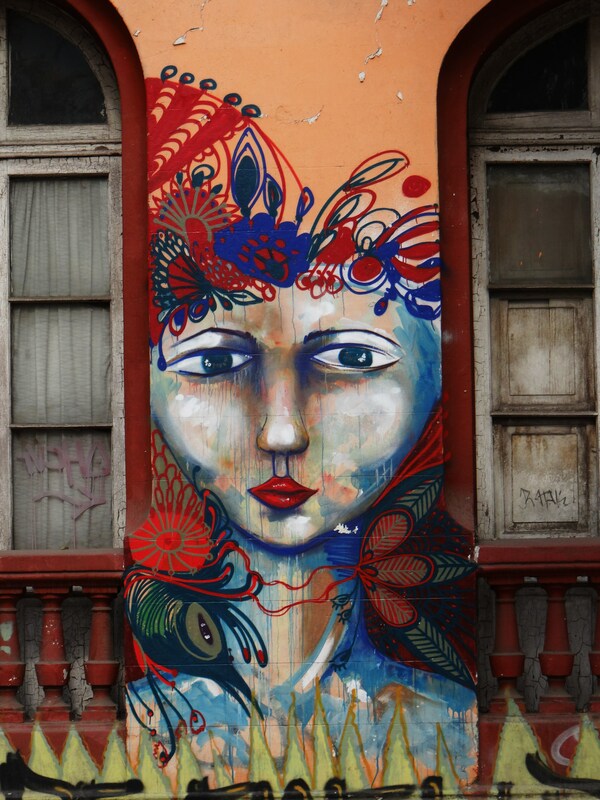 I agree Aian, the street art of Santiago is definitely gorgeous! It brightens up the city promotes Chilean art at the same time! I love these photos! It’s always amazing to me to see beautiful and unique street art that is at the heart of a cities art movement as graffiti in the UK is often simple due to the negative attitude to it here. I agree, the graffiti you usually see in cities are simple and often quite ugly but the street art that some cities allow do brighten up the place. It is creative and I think adds to a city’s character. Hi, Janaline! I found you on Twitter and thought I’d stop by and introduce myself. I LOVE all the photos of Santiago – I’m dying to get down there one day soon. What are you doing for work there? Hi there Jessica. Thanks for the visit, hope you enjoy all my tales of my adventures. I teach English as a second language at language schools which gives me the chance to move around a lot and also travel quite frequently. This gives me a great opportunity to actually get to experience the country and its culture. Wonderful street art. The variety is amazing. It should only get better with the support and encouragement of schools, etc. Like the colors and detail if the red jaguar. Yes, I think with the support of the government and public the artist will get the chance to improve and I would love to see what they create then. I think its the flower detail painted onto the skull that makes it beautiful rather that a gruesome symbol of death! Thanks Jill!! 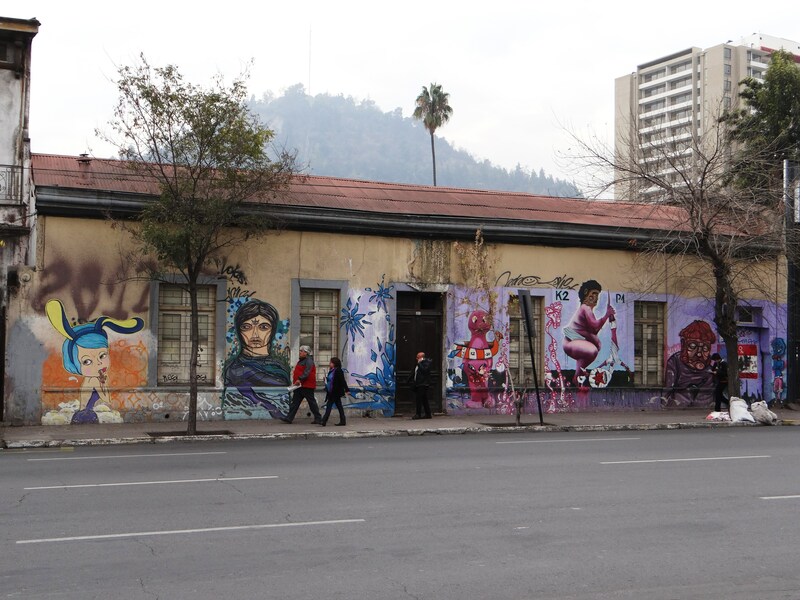 Santiago is a fabulous place and I am sure you are going to love exploring this street art filled city! Safe travels! These are beautiful, Janaline! I especially like the ones of the girls that incorporate parts of the wall into the picture. Thanks Ana! Yes, it is quite creative how the artists sometimes incorporate the features of a building into their paintings. It definitely adds a lively and artistic atmosphere to the city! These are wonderful; thank you for sharing them! these are just awesome! and so much creativity! I agree Know-All!! The street artists of Santiago are very talented! Thank you Opalla! Had a look at your graffiti filled post and it is quite beautiful graffiti. I can see that each part of the world has a completely different style of street art that is beautiful in its own way. Thank you Jayde-Ashe! I am glad you enjoyed this street art tour of Santiago. I agree, love the detail of that mural. La Moneda Palace, Art and Eating Empanadas in Santiago.